The regular practice of Jiujitsu over an extended period of time under the guidance of qualified instructors will significantly enhance your ability to protect yourself and your loved ones if the need may ever arise. The traditional Oriental Kyu-Dan Ranking System is a structured system used to measure skills, knowledge and progress in manageable steps. 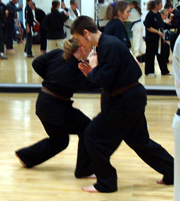 The CJC maintains a register of certified Black Belt holders in Canada. As a registered member of the Canadian Jiujitsu Council and a member of a CJC Registered Club Liability and sport accident insurance is available at no extra cost. When we participate in events and activities we expect to enjoy ourselves and meet fun and interesting people. This is particularly true when practicing in the Martial Art of Jiujitsu. You will meet regularly, practice intensely, and mix with a fun exciting community of like minded people. On a regular basis the Canadian Jiujitsu Council provides, through its member schools, a variety of technical training seminars. Contact for more details.